Announced back in July 2009, the Nikon AF-S NIKKOR 70-200mm f2.8G ED VR II is an updated version of its predecessor, the Nikon AF-S NIKKOR 70-200mm f2.8G ED VR, featuring a new optical arrangement and updated image stabilization technology, known as VR II. VR II offers up to 4-stops image stabilization to capture sharp images with relatively slow shutter speeds. This is important with a telephoto lens where magnification at 200mm means without VR II either a fast shutter speed – not always possible in low-light – or a very steady hand is required. With VR II however, slow shutter speeds such as 1/15th sec at 200mm will still achieve sharp shots, providing your subject isn’t moving of course! Designed for the Nikon full-frame FX format, the Nikon 70-200mm f2.8G ED VR II is also compatible with Nikon DX format cameras that utilise a smaller APS-C sensor. Mounted on DX cameras the x1.5 ‘crop factor’ increases the focal length to 105-300mm, an attractive benefit for enthusiasts into sports or wildlife photography. As Nikon’s flagship sports lens, it’s a must have for sports pros shooting Nikon, but the versatile focal range f2.8 fixed maximum aperture and image stabilisation make it a good general lens for events, weddings, portraits and press work, too. Costing $2,400 it’s an expensive proposition however, and with cheaper alternatives, notably the $1,400 Sigma 70-200mm f2.8 EX DG APO OS HSM offering similar features or the new $1,400 Nikon AF-S NIKKOR 70-200mm f4G ED VR available, does this latest Nikon version justify its price? 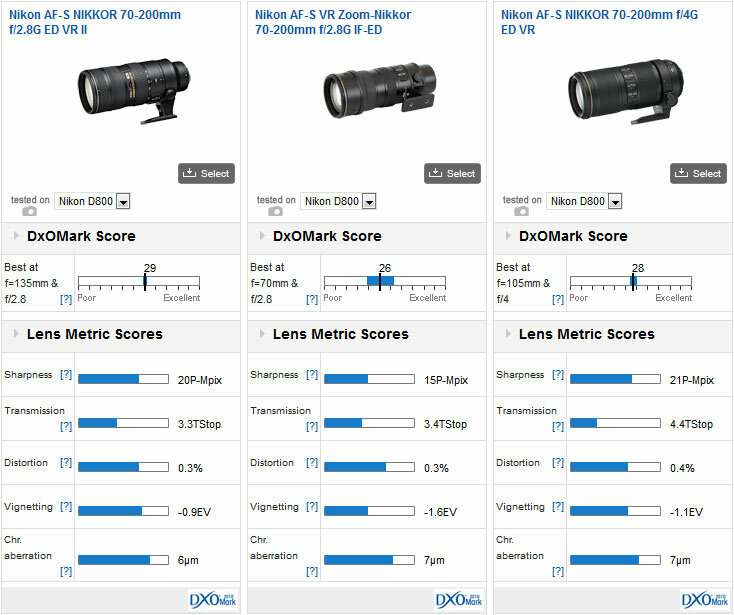 The headline DxOMark Scores for the Nikon 70-200mm f/2.8G ED VR II immediately bear out the phrase ‘you get what you pay for. A DxOMark Overall Score of 29 places it towards the upper end of the performance spectrum, and the DxOMark Sharpness Score of 20P-Mpix, attached to a Nikon D800, is very good for this type of zoom lens. 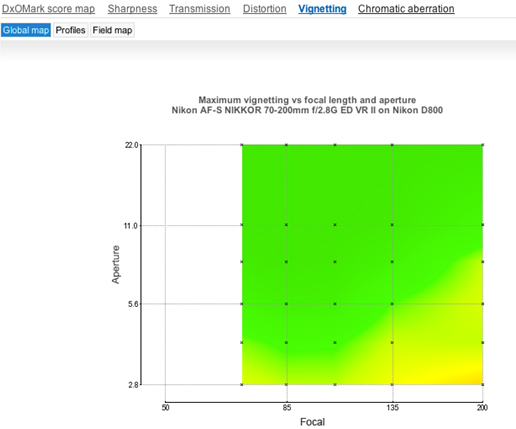 It’s also a bright lens with a good DxOMark Transmission Score of 3.3TSto. But, as you would expect from a zoom lens covering such a large focal range, there is some barrel distortion at the wider end and pin-cushion distortion when zoomed in, but it’s well controlled and achieves a good overall DxOMark Distortion Score of 0.3%. 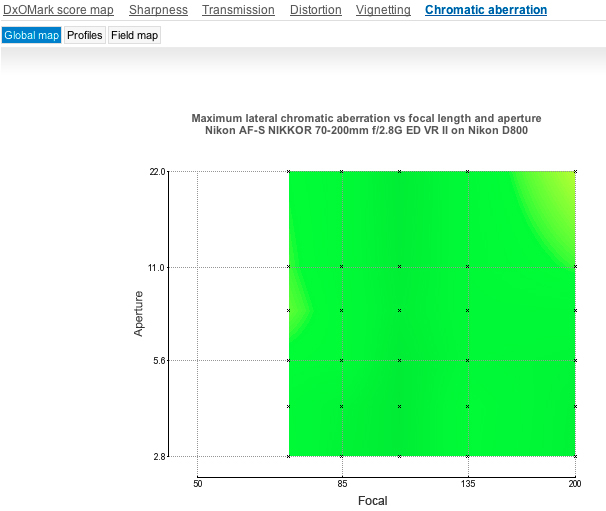 As well as a very good overall DxOMark Sharpness Score, the Nikon 70-200mm f/2.8G ED VR II resolution performance is consistent across both the focal range and most apertures. 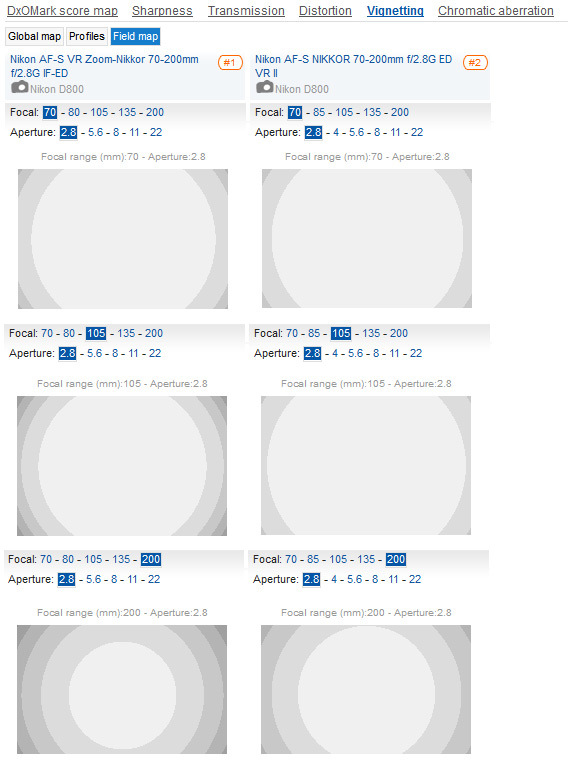 For wider apertures between f2.8 up to f11, resolution is excellent, which is particularly encouraging for photographers needing fast shutter speeds in low-light, and it’s only as the aperture is closed down to f16 that sharpness starts to tail off, but even at f/22 results are reasonable. 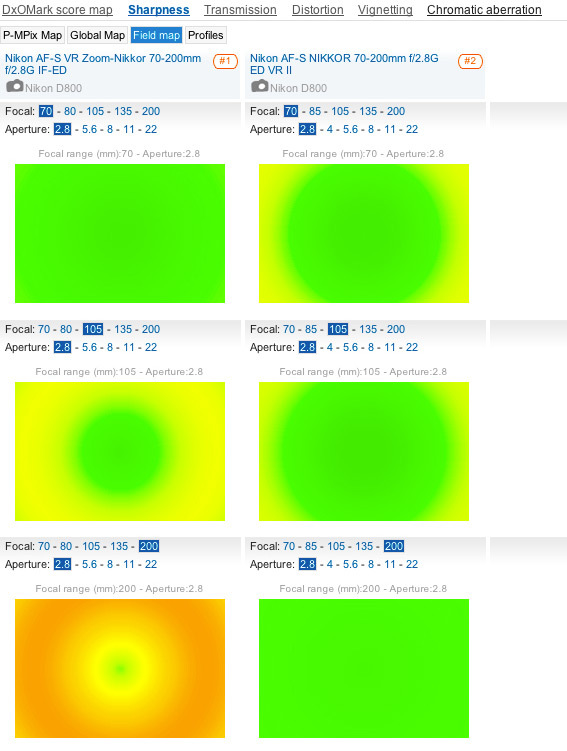 Vignetting is also an issue that plagues zoom lenses. The Nikon 70-200mm f2.8G ED VR II delivers some excellent results however, with no dark orange or red areas on our Global Map. The unwelcome vignetting effect is most prominent at 200mm and f2.8 however, which is a little unfortunate as it’s one of the common settings used on a lens like this. Fully zoomed in you’ll need to stop down to f8 to remove the problem completely but if you do need a wider aperture pictures at f4 result in less vignetting than f2.8. Another problem plaguing zoom lenses is Chromatic Aberration, which displays as coloured lines along contrast edges and is the result of the lens not aligning the red, green and blue light channels perfectly. The excellent performance of this lens continues in this regard however with Chromatic Aberrations well controlled at all settings. Nikon AF-S 70-200mm f/2.8G ED VR II vs Nikon AF-S VR 70-200mm f/2.8G IF-ED vs Nikon AF-S 70-200 f/4G ED VR: Nikon 70-200mm telephoto lenses battle it out. With overall DxOMark Scores of 29, 26 and 28 for these 3 current Nikon 70-200mm lenses, at first glance it looks like there’s not much in it, but that doesn’t tell the whole story and the devil is in the detail. 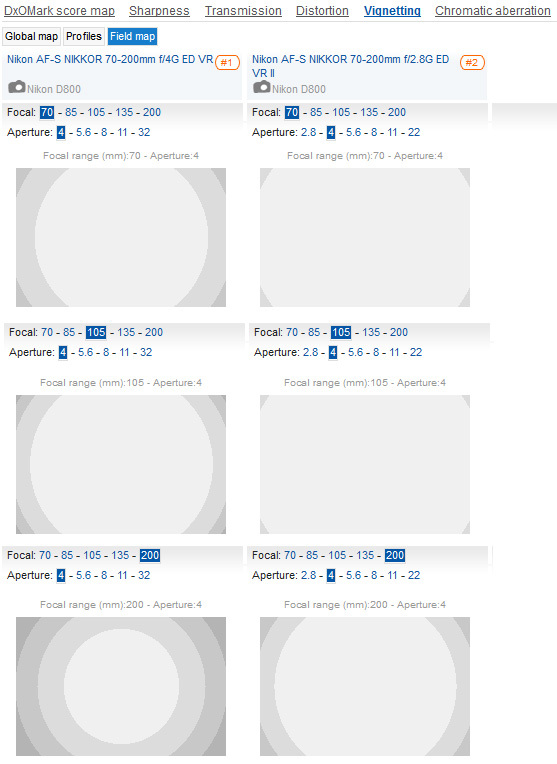 Looking at the old and new f/2.8 versions to start with, the Transmission, Distortion and Chromatic Aberration scores show there’s really not that much in it, but Nikon have made significant improvements to both Sharpness and Vignetting. The new VRII version offers a 25% improvement in Sharpness scoring 20 P-Mpix compared to 15 P-Mpix on the D800, and while the range of results on the first version is very large, indicating image quality is not homogenous, the range for the new VRII version is much tighter, and a positive step in the right direction. Costing $1,400 however the f/4 version – read our review here – is a whopping $1,000 cheaper, and in terms of overall image quality and Sharpness particularly it stands up very well against its bigger, heavier, more expensive sibling. 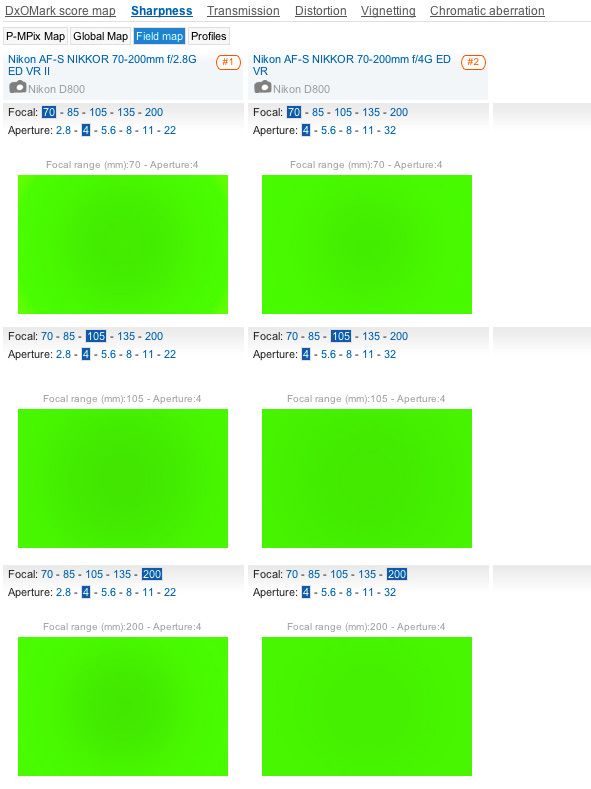 In fact scoring 21 P-Mpix for Sharpness it actually out-performs the f/2.8 version, but with 1 stop less light available at the maximum aperture it loses out by 1.1TStop for Transmission and so isn’t as bright as the f/2.8 version, and vignetting is marginally worse, too. 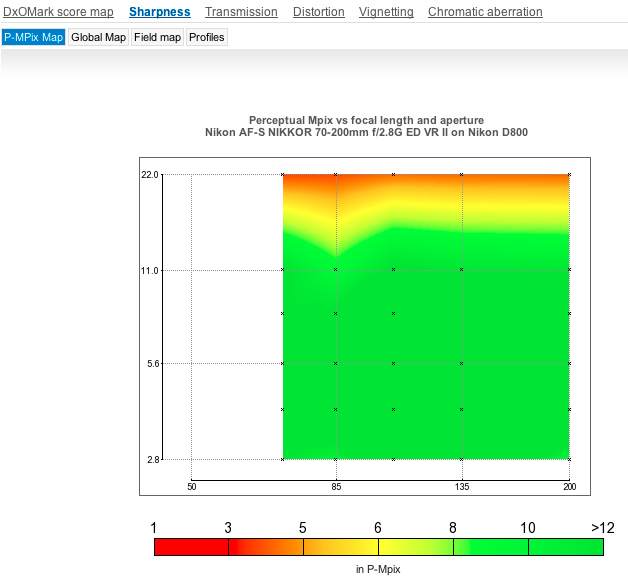 The Sharpness Field map at f/2.8 demonstrates clearly how the new VRII version is more consistent across the focal range and critically resolution has been improved significantly at 200mm, the old lens’s weak spot. This will be greatly welcomed by wildlife and sports professionals who predominantly shoot at this end of the range. The improvement at 200mm however has come at the expense of some loss of edge sharpness at 70mm, where the old version was flawless. Vignetting also been improved on the f/2.8 VRII version across the focal range generally and offers a +2/3rds Stop improvement over its predecessor. While there’s not much to choose between them at 70mm or 105mm, when fully zoomed in at 200mm, corner shading on the new VRII version is better controlled. At f/4 there’s nothing to choose between these 2 Nikon 70-200mm zoom lenses both displaying excellent edge sharpness right throughout the focal range, which is particularly impressive as it’s the maximum aperture of the f/4 version. Comparisons aren’t quite as impressive when it come to vignetting however where at f/4 the more expensive 70-200mm f/2.8G ED VR II version is better at all focal lengths while images from the Nikon 70-200 f/4G ED VR will require some correction, especially at 200mm. If you can afford it – buy it! 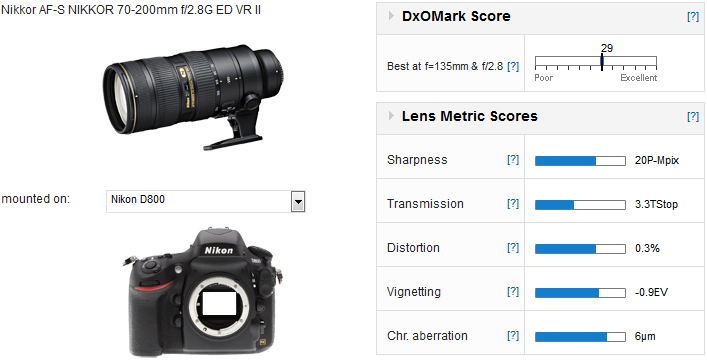 So, no surprises, one of the most expensive medium range telephoto lenses ever has impressive DxOMark Scores and nudges out both its predecessor and Nikon’s cheaper f/4 version to boot. In fact the Nikon AF-S NIKKOR 70-200mm f/2.8G ED VR II has no significant weaknesses and is the best zoom lens you can mount on a Nikon Full Frame body. It comes top in the DxOMark table of top 5 70-200mm lenses beating both its predecessor the Nikon 70-200mm f2.8G ED VR and the cheaper 3rd party competition from Sigma. 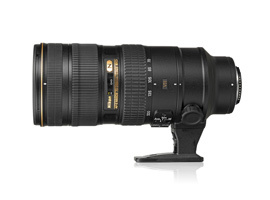 Costing $2400 it’s expensive however and for $1000 less the Nikon 70-200mm f/4G ED VR is an excellent lens too that offers the same sharpness as the f/2.8 version but with more vignetting visible shooting at the maximum aperture. If your photography demands a medium telephoto zoom with a fast maximum aperture that will deliver across the board, but particularly at 200mm, and your budget holds no bounds, go get yourself a Nikon 70-200mm f2.8G ED VR II. It’s one hell of a lens.